Drake Realty Group, a unique and highly specialized multifamily brokerage and advisory firm, was engaged by Houston based Sterling University Housing, one of the largest Student Housing Developers in the Country, to research, locate and procure a trophy Class A, Infill development site for a new high density, luxury student housing development project in walking distance to the LSU campus in Baton Rouge, LA. The strategy and process was unique and customized to the client’s exact requirements, driven by location, off market properties, meticulous research, and aggressive front end problem solving. 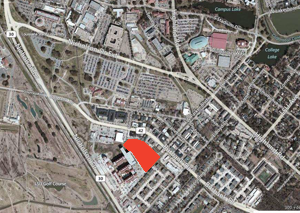 No properties were available in the LSU Campus Market that met the location and size requirements. Off market core infill properties in our search area were considerably smaller than our Minimum Size requirement of 4 acres. Timing for site procurement was immediate due to the nature and sensitivity of Student Housing product supply and demand. The perfect ‘off market’ site near the LSU campus was located, pursued but no deal could be made due to complex Seller constraints at that time. Approximately 1 year of follow up conversations, meetings and attempts to put a deal together ensued. Competitive Bid process against large publicly traded Student Housing Developers took place. Aggressive price and terms with multiple options, i.e., parking, location and parcel size. Pre-contract and pre-development issues surrounding the property. Detailed Market research and analysis of LSU Campus infill market and in-person tours of sites of interest. Student Housing Market rent, Under Construction and Proposed Project pipeline analysis. Aggressively pursued all off market core infill properties and provided client with detailed spreadsheets and aerials for each property and regular updated status reports on our progress and negotiations with property owners until the best sites were identified. Researched off market property ownerships and their properties achievable development densities, i.e., height, zoning, existing restrictions and any possible front end issues prior to negotiations. Located, procured and negotiated the winning and accepted proposal in a competitive bidding process for Sterling University Housings number one off market property of choice. Worked with Client to assist in pre-construction meetings and action plan goals needed to solve issues and close the deal. LOI / Contract negotiations and teamwork with Buyer and Seller through the close of escrow. Drake Realty Group located, procured and negotiated on behalf of its client the winning proposal for an off market 5.5 acre trophy infill property on Burbank Dr. for the future development of a Class A, core infill luxury Student Housing Development project. The property closed July, 2013’ with great success for both the Buyer and Seller and was the number one choice of all the properties we pursued for our client. For more information about how Drake Realty Group can assist with your multifamily brokerage and student housing needs, including site selection, procurement and negotiations, contact us.